See the new feature set enhancements to the enrollments dashboard! Users will have immediate access to the newly created insurance status information. The previous 24 hour waiting period has been removed to allow for newly created insurances to show an enrollment status of Available for eClaims, eligibility, and ERA if applicable. In addition, the 10 claim gating requirements for out-of-state insurances has been removed. Billers can now submit insurance enrollment immediately when they create a new insurance company. See additional options for insurance type when clicking on more filters when adding an insurance company. 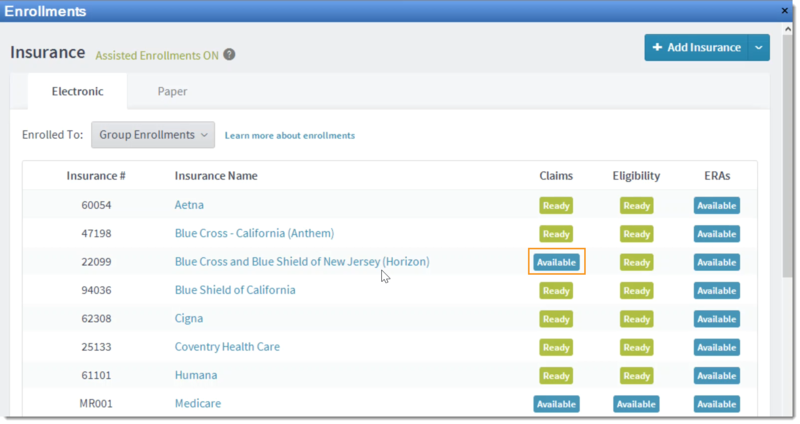 In addition, users can search for insurances based on the selected claim type. 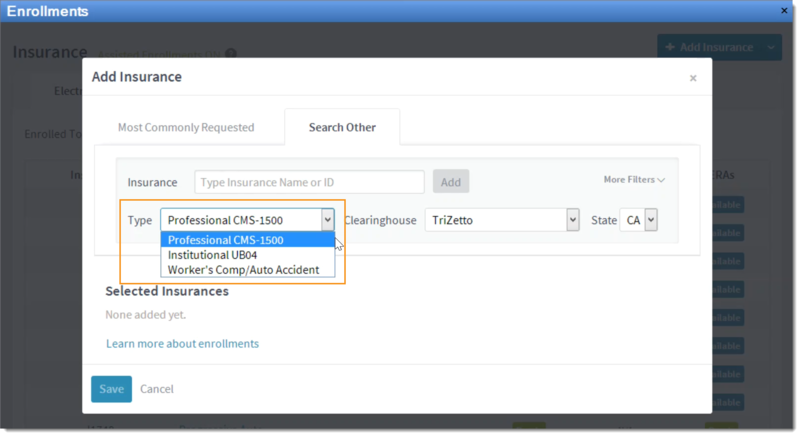 Know that users can add a custom insurance when typing a search name. 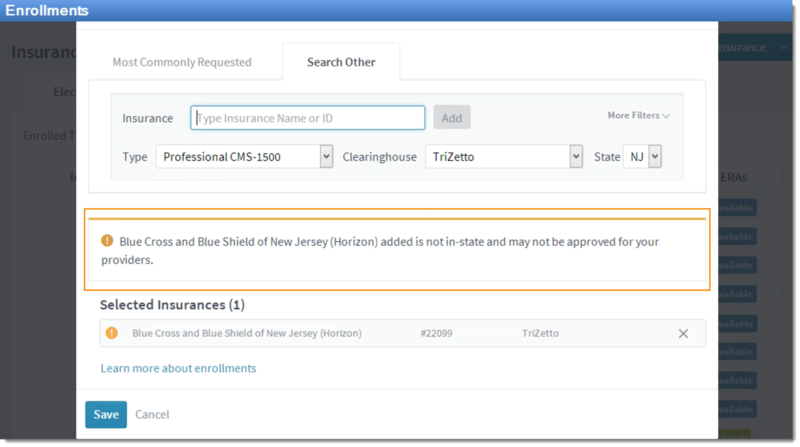 The enrollments dashboard will show a message alert when an insurance is selected that is not designated for their practice's state address. 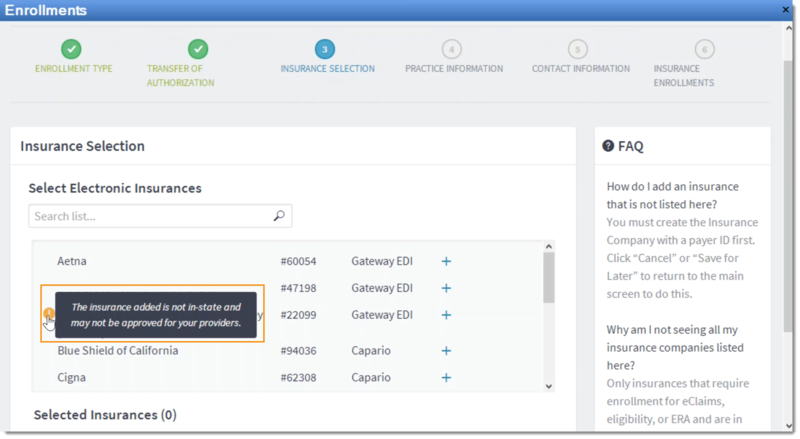 In addition the software will identify enrollment requests for insurances that are not in the scope of their practice's state address. Users can change the order of the procedure lines on any individual encounter. Simply open the encounter, hover over the line item and select Move Up or Move Down from the dropdown list. Upon selection, the procedure lines will adjust. Click save when done. 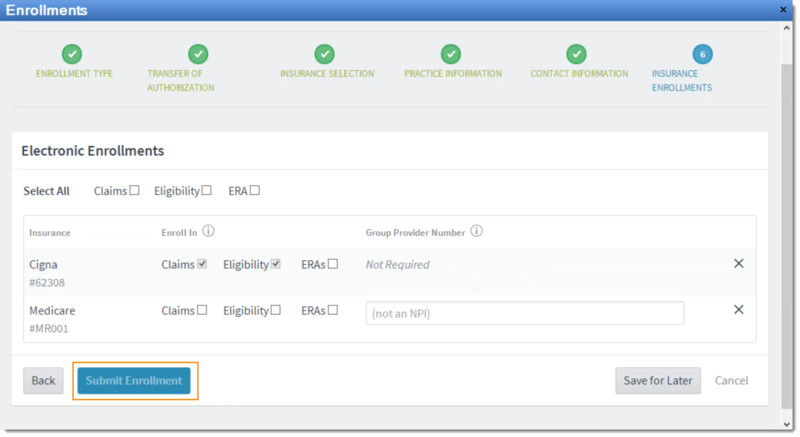 Users can now enable automatic claim submissions for each individual practice in their account. When enabled, automatic submissions will run daily at 8:00 a.m. PST and 8:00 p.m. PST. The run time may be up to two hours depending on the amount of users who have opted for automatic claims submissions. From the Settings menu, click options > electronic claims options. Checkmark enable automatic claim submission for this practice and click save. Fixed an issue where the user was unable to access the "find procedure code" and would receive an error message when attempting to access it from the desktop. Fixed an issue that occurred when a user ran the Account Activity Report and customized it to be grouped by Insurance Plan or Insurance Company. Prior to the fix, the total charges would not be calculated, and the grand total field would remain blank. Fixed an issue where the user would attempt to input the Post or Adjudication Date fields within the New or Existing Payment window within the PM. Prior to the fix, the software logic would incorrectly insert the date of "11/18/2003" whenever the date was entered incompletely. Three "Stored Procedures" have been updated to the correct error messages within the PM. Fixed an issue that occurred when a user attempted to run the Key Indicator Summary Beta report for any time-frame greater than 1 month. Prior to the fix, the report kept throwing an error. Fixed an issue where after attaching a document to a new encounter, when clicking "Save for Review,” the document never attached to the encounter. Fixed an issue that occurred when running the "Settled Charges" summary report. Prior to the fix, they would receive an error. Fixed an issue where the appointment details report was not showing all appointment reasons on the dropdown. 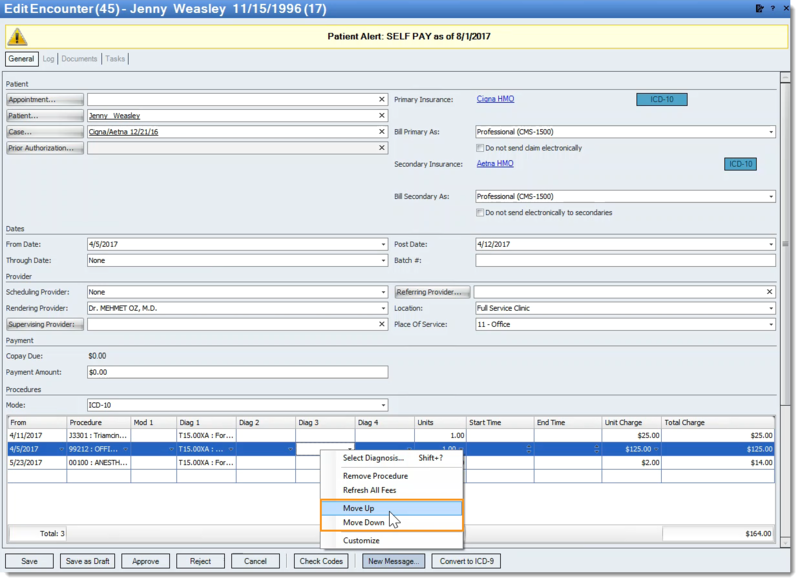 Fixed an issue that occurred when running the Appointments Detail report from the Navigation pane. Prior to the fix, not all the appointment reasons were available in the dropdown. Fixed an issue in Patient Statements. Prior to the fix, the phone field would display "NaN" when no phone number was listed in the system. Fixed an issue where the user would receive an unhandled exception error when trying to "Add Attorney" in the patient case during a new encounter creation. Fixed an issue that occurred when the user would try to "Update Patient (Marital status)" via API and only half of the statuses would reflect an update in the Desktop App. Fixed an issue that occurred when the user would run the patient statements for statements other than the default (e.g. 5 statements, 10 statements, 20 statements, etc.). Prior to the fix, the patient statement listing did NOT come up in alphabetical order (thus making it hard to find patients they want the research/exclude). Fixed an issue where the Encounter Form fields were being populating with the incorrect info (Last Statement and Last Payment). Fixed an issue that occurred when a KISB report was run for insurance. Prior to the fix, Medicare for 01/01/2016 to 07/31/2016 totals didn’t match the same report when run by month. Fixed an issue where the unapplied total in the Key Indicators Summary Beta included applied capitated payments.